Can I change Actual Funding information after a Deal has been funded? Yes. You can change the "Actual Funding" sections of the deal even after you've uploaded transactions to help pay off the deal. ALL you need to do is click on the "Edit" button which will allow you to edit: "Funded Date," "Administrative Fees," and "Expected Payback." 1. 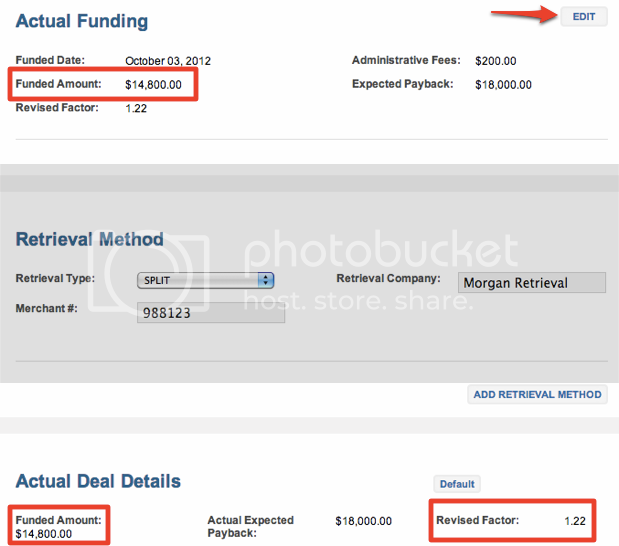 "Funded Amount" in the Actual Funding is the same value as the "Funded Amount" in the Actual Deal Detail section. 2. If you change the "Funded Amount," the "Revised Factors" in the Actual Funding and Actual Deal Detail will change as the Factor is equal to "Expected Payback" ("Actual Expected Payback" in the Actual Deals Detail sections) divided by the "Funded Amount."